The Brew Lounge: WBC @ CBC: Are you staying up for Best Picture? I don't know if I'm on a personal text exchange or at the end of a mass distribution, but I see from The Brew Lounge Insider stationed at the World Beer Cup award ceremony that Tröegs has pulled down Gold for its Troegenator in the Traditional German-style Bock category. Minutes later...this just in. Iron Hill scored two more to add to its trophy case: Lambic de Hill gets Bronze in Belgian-style Sour and Abbey Dubbel also gets Bronze in Belgian-style Dubbel. Minutes later...more struts across the stage from the Fertile Crescent: Weyerbacher takes a Bronze in Belgian-style Tripel for its Merry Monks. And, that's not all Johnny...Yards pulling down yet another Bronze for the Philly region...this one in the ESB or Strong Bitter category for its Extra Special Ale. Nice. 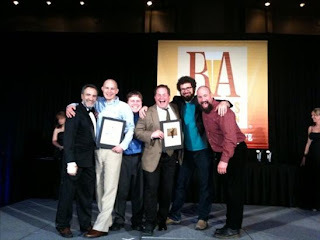 Iron Hill, not content to rest on two brings home one more Bronze and a Silver (British-style Imperial Stout) for good measure. I'm sorry, did you say you want more Gold? Than how about the Raspberry Torte for...wait for it...Iron Hill again! The Insider also has words of high praise for Sean Paxton, the Home Brew Chef, who has put out, reportedly, the largest beer dinner ever...roughly 2,000 guests times 5 courses. I'm not staying up all night, and considering that Chicago is an hour behind the East Coast...if I hear of any more awards germane to the Philadelphia region before I crash, I'll be sure to pass them along to you....that is, if you're actually still awake, actually online and see this, and/or if you actually care about such things. There's likely to be a typo in what you just read..seeing as how I transcribed from text messages that I was receiving. If you care about an accurate and complete list, just head on over to the official spot for such things. Congrats to all. How many more walks across the stage you guys have in you tonight?